"Easy to learn, inclusive for all ages, and endlessly fun." "Collect resources and build settlements across an island." "Guess the identity of secret agents with help from your teammates." "A blast for younger children, and a great way to foster a collaborative spirit." "You must work as a team to cure widespread diseases." "Fun for children who are learning to spell and working on their vocabulary." "This classic board game has all the original pieces." "Create a new, exciting story for yourself as you navigate around the board." "If you’re looking for a dark guessing game this is a great purchase!" "Put your spatial reasoning and critical thinking skills to the test." "It requires a mixture of luck and strategy to win." "Even kiddos who can’t count or read yet can play this game of chance." "This Googly Eyes game is so much fun, you won’t be able to see straight." You may not have heard of the Sequence Game before, but this card-based strategy game is sure to become a family favorite. The best of both worlds, this board game is easy enough for kids to learn and tricky enough to keep adults on their toes. You can play the Sequence Game individually or in teams, and is recommended for kids ages seven and up. Here’s how it works: Each player or team gets a hand of standard playing cards, and during each turn, they put down one card and cover the corresponding spot on the game board with a chip. The objective is to get five chips in a row, and each round usually takes 10 to 30 minutes. The Sequence Game is a great family board game, as it’s easy to learn, inclusive for all ages, and endlessly fun. This board game requires a combination of strategy and luck, and your family is sure to get increasingly competitive the more you play! If you regularly have family game nights, you should definitely add Catan into your arsenal of party games. This adventure-based game is perfect for three or four players over the age of eight, who will all battle to collect resources and build settlements on the island of Catan. The Catan board game comes with 19 hexagon tiles that make up the playing board. These tiles are arranged randomly at the beginning of each game, so no two games are ever the same! At the start, each player gets color-coded settlement, road and city pieces, and the overall goal is to collect resource cards to build structures around the island. Players earn “victory points” as they build various structures, and the first player to 10 points wins! The premise of the game is relatively straightforward, but there are a lot of rules and obstacles that make the game fun — players can trade resource cards, sabotage each other with the robber game piece and more as they race to become the conqueror of Catan. For a fast-paced team game, check out Codenames. The premise of this board game is to guess the identity of “secret agents” with help from your team’s spymaster, and the word play will keep both kids and adults challenged and entertained through multiple rounds. Gameplay typically moves quickly, finishing in around 15 minutes. This fast pace lets you switch up teams or demand a rematch — which might be necessary if things get competitive. Want a game that’s just for the kids? Richard Scarry's Busytown, Eye Found It is a highly rated kids board game, designed for children ages three and up. Using the six-foot game board, kids will work their way to Picnic Island, searching for hidden objects in an I-Spy style challenge. You can have up to four players in each round of Eye Found It, which is designed to encourage collaboration between players. 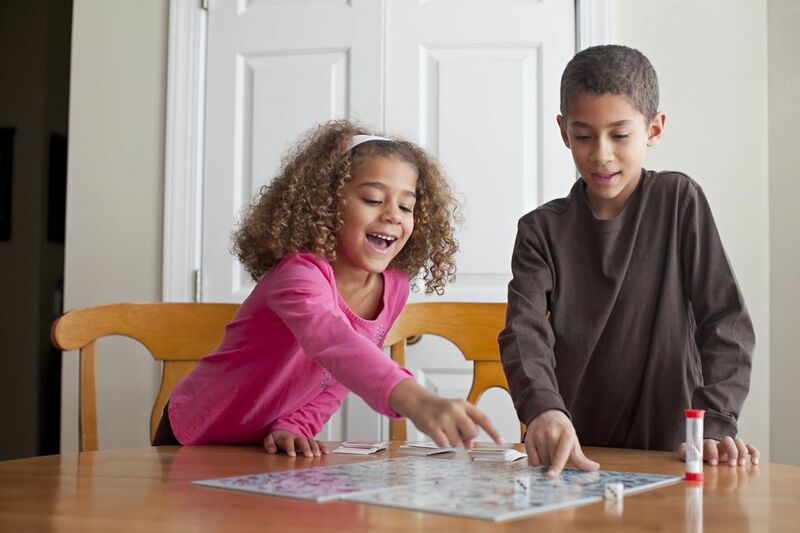 On each turn, kids will spin the spinner, which tells them to move a certain number of spaces or solve a “Goldbug Mystery.” When it’s time to tackle a mystery, all the players work together to search for certain objects on the game board — balloons, fire hydrants, etc. If they find five objects before time runs out, they can move five spaces. The goal is to make it all the way to Picnic Island, where a pair of hungry pigs are eating all the food. Richard Scarry's Busytown, Eye Found It is a blast for younger children, and it’s a great way to foster a collaborative spirit during playtime! Still can't decide on what you want? Our round-up of the best board games for kids can help you find what you're looking for. One of the latest crazes in board games is cooperative play, where participants work together toward a goal instead of competing against one another. If you’re looking for a cooperative activity for your family, your best bet is Pandemic, an apocalyptic board game where players must stop the spread of diseases to save the world. In a cooperative board game, you all win or you all lose. In Pandemic, several life-threatening diseases are spreading across the world, and you must work as a team to find the cure. Each player is assigned a character, such as a scientist or operation specialist, and has unique strengths that they contribute to the group. During each turn, players can move around the world, share information, treat infections and work towards a cure, but the epidemics spread just as quickly so you need to work efficiently. If you want an extra challenge, you can make the game harder by starting out with a greater number of diseases on the board. Because the rules are a little complicated and there’s a lot of strategy involved, Pandemic is recommended for teenagers and adults. However, once your family gets the hang of it, they’ll be addicted to the intense cooperative gameplay. Want to take a look at some other options? See our guide to the best cooperative games. Scrabble reigns as one of the best word-based board games. This highly-rated classic can get pretty competitive with seasoned players, but it’s also a lot of fun with children who are learning to spell and working on their vocabulary. This family game is designed for players eight and up, and there can be two to four players per round. However, don’t be afraid to team up, especially if you’re playing with younger kids! Scrabble comes with a game board, 100 wooden letter tiles, 4 tile racks, 1 drawstring letter bag, and game guide. To start the game, each player draws a certain number of tiles, and then players take turns creating words on the board, building off existing words and earning points for each letter. You can increase your points by landing on designated spaces for double or triple word or letter scores. Scrabble has been around for many years, and it’s sure to be popular for many more, thanks to its simple, yet addicting gameplay. This board game is exciting for players of all ages, making it a must-have for your family’s game collection. Still can't decide on what you want? Our round-up of the best word games can help you find what you're looking for. If you’re in the mood for a highly competitive, cult-classic board game, the obvious choice is Monopoly. This Classic Edition of the famous board game has all the original pieces, including money, houses, hotels, silver game pieces and more, and it’s sure to be a hit with both new and experienced players. A refresher on the rules: In Monopoly, two to eight players start at GO, rolling the dice and moving around the board. You can purchase empty properties that you land on, but if someone else owns the space, you have to pay them rent. Build houses and hotels to charge higher rents, and don’t forget to collect $200 as you pass by GO! The game is over when you own enough properties to bankrupt all your opponents. A game of Monopoly usually lasts a few hours, and it can definitely bring out people’s competitive spirit. This all-time favorite family board game deserves a home in every game lover’s collection. Ever dream of becoming a secret agent or having a huge family? Well, in The Game of Life, you can reinvent your life for an hour—creating a new, exciting story for yourself as you navigate around the board. This family board game is a classic, and it’s sure keep to your whole crew entertained no matter how many times you play it. The Game of Life is best for players ages eight and up, and you’ll need two to four people for each game. During every turn, you’ll spin the ​colorful wheel, then navigate around the board, making choices for your pretend life. For instance, you can choose to go to college to expand your career options or forego higher education and jump right into a job. As play continues, you’ll be able to buy and sell houses, get married and start a family, and achieve lots of other interesting accomplishments. This family game comes with a gameboard, spinner, cards, Spin to Win tokens, cars, pegs, money pack, and game guide. It’s a tried-and-true family favorite, as you’ll be able to create an alternative life for yourself every time you play! In the mood for a brainbuster? The Clue Game is another family favorite, letting you solve the murder in the mansion in a suspense-filled gameplay. Was it Colonel Mustard in the kitchen with the candlestick? Or Miss Scarlet with the revolver in the lounge? The only way to find out is to play! This highly-rated board game is for kids eight and up, and you can play with two to six players. The Clue Game comes with several props, including the gameboard, six tokens, six miniature weapons, 30 cards, a case file envelope, a pad of detective notebook sheets, dice and, of course, a game guide. During each turn, you can explore the mansion, coming up with theories on who the murderer is and what weapon they used. Other players can then disprove your theories, until someone finally figures out the crime. The Clue Game is a hit among reviewers, who say solving murder mysteries never gets old. If you’re looking for a dark guessing game that your family can really get into, this is a great purchase! Interested in reading more reviews? Take a look at our selection of the best mystery board games. This Tetris-like board game will put your family’s spatial reasoning and critical thinking skills to the test. The Blokus Board Game just has one rule — your game pieces have to touch at the corners — but there are endless possibilities as you claim territory and block your opponents on the board. Blokus can be played with two to four people, and everyone starts out with 21 color-coded game pieces that are shaped like Tetris bricks. Players take turns putting pieces on the board, and the only rule is that your pieces can only touch at the corners. The object of the game is to put as many of your shapes down as possible while blocking other players from putting down their pieces. One game usually takes around 30 minutes, and the winner is whoever managed to put down the most pieces. It sounds simple, but Blokus is surprisingly challenging and addicting! In addition to providing hours of fun, Blokus will exercise and strengthen your critical thinking skills — which is why it won a Mensa award for promoting brain activity. Take family game night to a whole new level with this super-competitive board game. Sorry! is known to get players riled up, as you can bump competitors back to the starting line as you race to get your all pawns into the safety zone. Sorry! is perfect for players ages six and up, and there’s room for up to four people in each game. It comes with a gameboard, 12 pawns, 45 cards, two power-up tokens and instructions. During each turn, you’ll draw cards and navigate around the board with your color-coded pawns. The object is to get all your pawns to safety, but beware —other players can bump you back to start, forcing you to begin all over! Sorry! requires a mixture of luck and strategy, making it a fun, unpredictable game for the whole family. Reviewers love this classic board game, which comes with several new add-ons. However, you can always play it the “old way” if you like those rules better! Candy Land is a classic for a reason: It’s fun for everyone. Even the littlest kids who can’t count or read yet can play this sugarlicious game of chance. The race to the castle is on, but there are some sweet (and not-so-sweet) surprises along the way. While there have been plenty of updated twists on Candy Land (My Little Pony Candy Land, anyone? ), this set keeps things classic. Modeled after the original 1962 version, it’s a step back in time, but it still has all the same basics (four gingerbread men and colorful cards) that we’ve all played with in recent years. This version also comes with a nostalgic tin box that holds the board and all the pieces and looks great displayed on a shelf until it’s game time. This Googly Eyes game is so much fun, you won’t be able to see straight… literally. Do your eyes deceive you? Why yes they will as you don vision-altering glasses then try to draw something the other players can recognize. It sounds easier than it is, and the resulting artwork and guesses are hilarious. Players roll dice to see which level of lens they must wear (they range from mildly altering to those that majorly mess with your eyes) and draw a card to determine what they must draw. Then the timer starts ticking. If your team guesses correctly, you get to go again. If not, the next team is up. First one to the finish line wins. Recommended for ages 7 and up, 4 to 16 players can play at a time, so it’s great for big groups and parties. Customers who have purchased the game say it serves up scads of silly fun. Our reviewers spent 44 hours testing five top-rated family board games. We asked our testers to consider the most important features when using these games, from their age range to their entertainment value. We've outlined the key points here so that you, too, know what to look for when shopping. Number of players How many people do you expect will be playing your game at once? This is important to consider since some games are better suited for two players while others can accommodate eight or more. If you have a big family or like to entertain a crowd, pick a game that supports a larger number of players. Difficulty Some games require more critical thinking than others, which could be a challenge for younger players. Plenty of options can be engaging for people of all ages, though — just pay attention to a game’s age rating to determine if its difficulty level will suit your situation. Time Playing time is another factor to consider. Our list contains both shorter games that require your quick-thinking abilities and others that test your problem-solving skills over a number of hours — just think about which is the best fit for you! Our testers loved that this game was easy to learn, set up, and play. One reviewer also thought that it became more fun with every round: “It does a great job of taking a simple concept that’s similar to games that we already know — like Bingo or Connect Four — and making it a cooperative strategy game that becomes more intense and intricate as you become accustomed to it.” However, one of our testers thought that young children “wouldn’t enjoy it as much as older players who are more accustomed to strategizing.” One reviewer also noted that, since players aren’t allowed to speak about tactics with their teammates, the atmosphere could get “slightly stagnant” at times. Picking up this game was easy, according to our reviewers, who also loved the fact that its rounds were short and sweet. One tester also spoke to its entertainment value: “I like that it involves group dynamics,” she said, “so as the group grows or you introduce new people, the game strategy could completely change. It keeps things interesting!” Our reviewers didn’t have much to say in the way of negatives, but one tester pointed out that because each round only took about 20 minutes, playing multiple rounds in a row could feel repetitive. “What I liked best about this game was that there’s no winner,” noted one of our testers, who played along with her young children. “To finish the game, all players have to work together — it promotes teamwork!” Our reviewers also loved that it was fun and easy to learn. Its downsides, according to our testers, were that it had a very large surface area (so you need a lot of floor space to play) and that its pieces felt flimsy and not very durable.